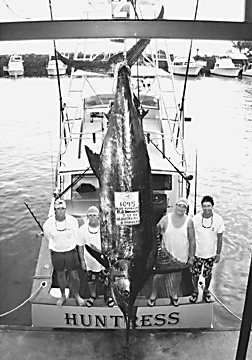 This was Kona's third blue over 1,000 lbs in 2001. Capt. Randy Parker was dragging a Marlin Magic Super Dog in his wake on a 130-class outfit when the marlin struck. Barrett O'Donnell fought the fish for 1 hour and 45 minutes from the HUNTRESS, a 42-foot Merritt.